I had my dream wedding here and it was worth every penny. I came across the Sanctuary Estate when I scheduled a site visit at a nearby winery. I had a relatively last minute request to visit the venue and Robin, the owner, happily accommodated me. Needless to say, the grounds are absolutely STUNNING and at first sight I knew I had to have my wedding here. 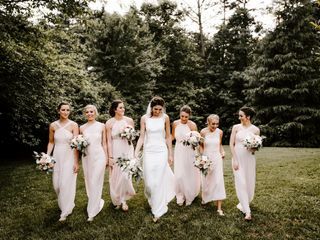 This venue has everything you will need for your day- a bridal suite for you and your bridesmaids to get ready, covered pavillion for the ceremony in case of rain, several different areas for photographs, a full service reception area (barn) with decorations, tables and chairs. Planning process: I loved that the wedding packages are up front and all inclusive and that there are no hidden costs/surprises. You have the option to 'add' to the wedding packages if you elect to do more florals/have an additional appetizer, etc, but you do this later on in the process. For me I was unsure of whether I would have 100 or 125 guests, but I never stressed about it because I knew exactly how much it would cost either way! I worked closely with Cindy, the wedding coordinator, who was super sweet and very helpful throughout the whole planning process. I met with Cindy for 3 planning sessions and attended 2 tastings to meet Tim, the caterer for the venue. At the tastings we met other couples getting married at this venue. I really liked the group setting because I was able to ask people what they did for rehearsal dinner/transportation/accomodation and of course you got to taste the food and tons of different cake flavors. I had one floral consult on the same day as my last planning session. On the final planning day you also finalize your food selections, cake flavors, decorations, 'add on' items with Tim. Actual day of: Everything went flawlessly and the weather was perfect. I did not worry about ANYTHING. Cindy took care of communicating with my vendors to make sure they were there on time and knew where to go. She made sure we stayed on schedule and came and found us when it was time to do the cake cutting and toast. The food was AMAZING and all my guests were raving about the cake. We had 3 flavors (our favorite was the Reese's Peanut Butter cake). Everything from my bouquet, food, table settings, decorations, to florals was perfect. I wish I could get married all over again!! Everyone had a fantastic time and I'm so glad I selected the Sanctuary Estate. I recently got my wedding photos back and this place is picture perfect. Recommendations: This venue comes with a package but but you do need to put in some leg work and make sure you arrange for things that are not included - e.g. BYOB, bartender, sound system. Make sure you ask the right questions and think through the details that are not included. Robin, Cindy, and Tim will have the answers to your questions because they've done this a zillion times! They also have recommendations for vendors if you need. We are so grateful that we came across the Sanctuary Estate. It is a truly breathtaking property with wonderful owners who will make it possible for you to have your dream wedding! 10/10 would recommend! Thank you Nicole.....we so loved having you and Shane here at Sanctuary Estate. Happy life together and please stay in touch. We absolutely LOVED getting married at Sanctuary! Robin and Cindy were so helpful in helping us create the perfect day. The venue was beautiful, the catering staff were professional, and our guests had so many positive things to say about the food, cake, and decorations. Having my wedding at Sanctuary Estate was an absolute dream!! Their team was so good to everyone during the planning process. I loved everything about this venue!! Sanctuary Estate made my wedding day exactly how I had always dreamed it would be and so much more. Cindy and Tim were able to be flexible with my work, school, and practice schedule. My wedding experience was stress free, thanks to them! I highly reccomend them to any couple looking for a venue. Robin and her team were the bomb.com!! We wanted something small, family only and very laid back. She went above and beyond to make it PERFECT for everyone involved. It was everything we had hoped for - we have both our ceremony and reception in the barn (it was a very small wedding) but it was absolute perfection. The food was delicious, DJ in point, and wedding coordinator was crazy attentive! You can’t go wrong with The Sanctuary for your event! Amazing experience. Sanctuary Estate is gorgeous. Robin, Cindy, and Tim are awesome to work with. We could not have asked for a better wedding day....it was absolutely perfect. 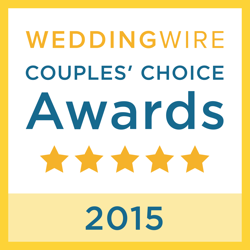 We are continually receiving comments from the guests on the beautiful wedding and beautiful venue. My daughter was married this past weekend at Sanctuary. I can't thank Robin (owner) and Cindy (day of coordinator) for all they did to make the day go as smoothly as it did. They kept us informed of the possibility of impending weather changes and when the torrential rain came an hour before the wedding they did all they could to keep us informed of when the rain would let up and what rain plan could be set in place. The rain slacked off enough to set the chairs out as guest started arriving and the wedding started on time with no rain during the entire ceremony. Leading up to the wedding Robin and Cindy both responded quickly to all our questions. The venue is breathtaking and all of our family and friends are still in awe of the beauty that it holds. Sanctuary is truley a hidden gem here in Cleveland. GA. , but so are Robin and Cindy. Robin thank you for making us feel welcome in your home and providing the most magical place for my daughter to be married. Cindy... what can I say! You are THE BEST! We could not have made it through the wedding day without you. Utilize all of the space as much as possible. If it rains, you now can get married on the dance floor, which is an excellent back up plan. Sancutary Estate staff was great and allowed to wait and see if we needed to move the ceremony inside until noon the day of the wedding. They are very flexible. Overall, it was an amazing venue! Everything was absolutely beautiful. Robin and her staff were fantastic. 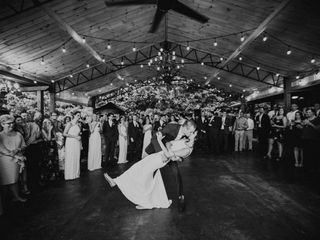 The new cover over the dance floor made the already gorgeous venue even better. In my opinion you will not find a more beautiful venue anywhere. Because of Sanctuary Estate my daughter had the wedding of her dreams. I would not change a thing. Perfect in every way. My daughter wanted a romantic venue for her wedding and Sanctuary Estate fit the bill perfectly! From our first visit with Robin, the owner of the home/venue, we felt instantly at ease. Robin responded to any questions we had during the process in a timely manner and was extremely easy to talk to and work with. We had our own vendors we wanted to use and it was not a problem at all. I would highly recommend this venue for a beautiful wedding experience. We just had our wedding at Sanctuary Estate and it truly was the Best Day Ever! The whole day flowed smoothly thanks to Cindy the wedding planner. I honestly couldn't of imaged a more perfect day. If you're looking for a venue that offers the best of both worlds then this is it. I'm absolutely thrilled that we choose such a beautiful venue with kind and caring people that really care about how your special day will turn out. What an extraordinary, stunning and magical wedding weekend for our daughter on October 29, 2016. Robin is a treasure, and Cindy and everyone went above and beyond to make sure everything went well. Our families, friends and guests were welcomed and taken such good care of, and everyone was captivated by the surrounding beauty. 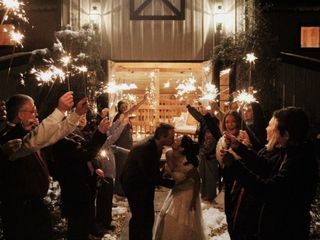 From the Rehearsal Dinner on the poolside veranda, to the arrival of the fairy princess and her dad in the horse drawn carriage, to the gorgeous ceremony by the fountain in the garden, and then the absolutely wonderful dinner and dancing at the barn - it was simply perfect. 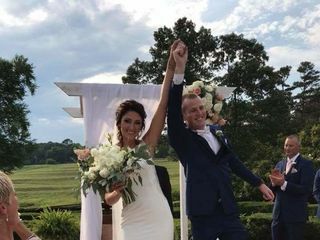 Robin Kinsey and Sanctuary Estate - thank you for helping us make Ashlee's wedding a dream come true for she and her beloved Adam. We will never forget this wondrous weekend. Sanctuary Estate was home for our daughter's fairytale wedding on October 22, 2016. From the first time we visited the property until the event was completed, it was a pleasant experience. Owner, Robin Kinsey and coordinator, Cindy worked tirelessly to make sure every small detail was completed as we desired. All of our family and guests were as equally impressed. I highly recommend this north Georgia venue for your wedding event. Your choice of options are many with sites for rehearsal dinner, bridal brunch, ceremony and reception spots on this lovely property. This homestead is a wonderful place to start anyone's happily ever after. We highly recommend Robin Kinsey and her lovely plantation venue, Sanctuary Estate. Our daughter lived her dream-come-true wedding and we could not have been more happy with the entire experience. 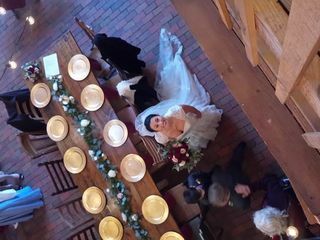 We used Sanctuary Estate for our Rehearsal Dinner (~50 people) and Wedding (~150 poeple), and it was absolutely perfect. The venue staff were very helpful, professional, accommodating, and responsive - and the house & barn are absolutely amazing! You'll save some money on decorations and flowers because the venue is beautiful in and of itself. You'll also save on catering as well by paying N GA prices vs Atlanta prices. My wife loved the 2,000 square foot bridal suite, which was perfect for her 8 bridesmaids plus family. Our family & friends loved making it a little vacation and renting a few cabin up there for the week as well! Our photographer just loves the venue because you absolutely can't take a bad picture there. I definitely would recommend this venue to anyone! If your looking for a Fairy tale Wedding, this venue is for you. It is absolutely gorgeous. My daughter had her dream wedding come true. We had a boxwood garden ceremony in front of a beautiful fountain. This was in front of the white Southern home. 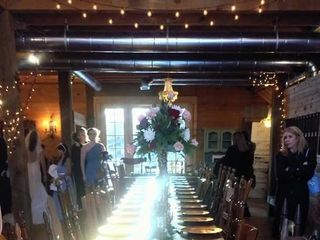 The reception was held in a beautiful barn ,patio dancing with overhead string lighting. Every guest was captured with the beauty. Can't go wrong with this place. My wedding at Sanctuary Estate was so beautiful. The owner Robin was so helpful through the whole process and would give tips and pointers when we needed it. Her Day of Coordinator Cindy was also a dream to work with. She would help me get in touch with all the vendors and make sure they knew what they were doing. On my wedding day if there were any problems I never knew about it because these two ladies made everything happen without a hitch. ALL of my guests said it was the most beautiful wedding they had ever been too and I agree. Sanctuary Estate also recommends a caterer Gree Gables with owner and baker Tim. He is phenomenal. I wanted a lush romantic wedding with lots of flowers and he made it happen. We sat down with him twice to go over things that I wanted and I showed him pictures and he made my dream come alive, literally! My bouquet was gorgeous and I had pedestals with flowers going down the aisle to the flower lined fountain. My wedding at Sanctuary Estate was a fairytale come true and what I had been dreaming of since I was a little girl! What a wonderful choice we made to have our special day at Sanctuary Estate. Even though the rain was relentless, the owner Robin made sure everything was just beautiful and seamless. From getting ready in the gorgeous bridal sweet, to the intimate details at the barn, everything was just perfect. If you want a gorgeous southern wedding with a charming atmosphere, look no further! This is the place. As a couple, we both said we would not have changed a thing. Wow! This place is the most gorgeous place I have ever been to & we were so excited to be able to have our wedding here. Robin has paid so much attention to detail that you don't need to spend hardly anything on decorations. She was so accommodating and very responsive. She was able to recommend vendors when I had no idea where to turn. Thank you Robin for helping to make our day a dream come true! Loved having you and Jay as a Sanctuary Estate Couple. So happy you were so happy!!! 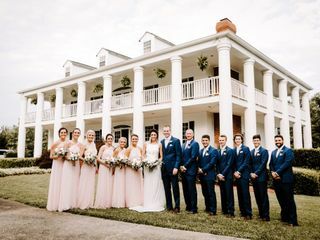 Sanctuary Plantation is a fantastic location for a wedding, rehearsal dinner, or any other event where a gorgeous country setting surrounds a great facility in their newly-renovated barn. The venue was immaculate. The wedding reception was decadent. All-in-all I would describe my experience with Sanctuary Plantation as tasteful and timeless. Thank you so much for a great weekend! Robin and sanctuary plantation are wonderful! We had a great time at Sanctuary Plantation! It was absolutely gorgeous, with the vast farm land, the gorgeous home, and the renovated barn. There was a beautiful dance floor area right outside the back of the barn which made for an amazing reception. 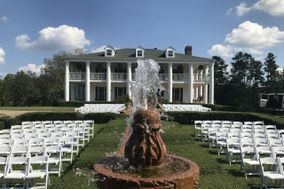 Would definitely suggest Sanctuary Plantation for weddings and special events!